The rules of the game are lengthy, detailed, and often obscure or nonsensical, but the players are instructed to follow them to the letter. There is a catch, however: a certain amount of cheating is not only tolerated, but accepted; not only accepted, but required. No one knows how much cheating is needed to win, and how much additional cheating condemns one to not being liked, not being promoted. If you liked this post, please tell your friends and share a comment in StumbleUpon. Subscriptions to A Memorable Fancy are available on Amazon. (www.bit.ly/Fancies), or just Follow this site. See www.terencekuch.net for a profile of the author, publications, reviews, etc. 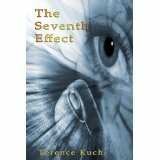 *The Seventh Effect: a thriller from Melange Publications about a new kind of bioterrorist plot against the USA; praised by Kirkus Reviews. *See/Saw: a literary adventure from Ink Smith Publications about implanting memories, and a murder. Hello, I’m Micah King. I noticed you didn’t have an audio edition for your book. We’d like to offer you our services in reading and recording your book. We have real people reading… not a computer! This allows listeners to connect to you, the author, and the book easily. There is a growing demand for audio books and having another option for your readers on the go is a great way to increase your profits. We’d be happy and grateful to work with you so please contact me with the information I sent, thanks. Mr. King: I retained subsidiary rights to my two novels (from two different publishers), so I can license your firm to make and sell an audio version of either or both. I would expect a token advance and some reasonable royalty agreement. Thank you for your interest in my work.